VIDEOS HAVE EMERGED of attacks against people in Thailand accused of insulting the country’s monarchy, after a woman was arrested for posting ‘disrespectful comments’ online about the recently deceased king. The videos showing mob justice come after the death of the world’s longest reigning monarch last Thursday – Thailand’s King Bhumibol Adulyadej – which left the nation bereft of its key pillar of unity. The days following his death have seen a remarkable mass outpourings of grief from black-clad Thais. But it has also unleashed small but vocal ultra-monarchist forces, including mobs and online crusaders scouring the web and bent on punishing anyone perceived to have insulted the monarchy. Another video widely shared on social media showed an elderly woman on a Bangkok bus being berated by fellow commuters in the presence of police. As she exits the bus, the woman is slapped in the face by another woman dressed in black. It is not clear when the incident took place but the video was uploaded last night. 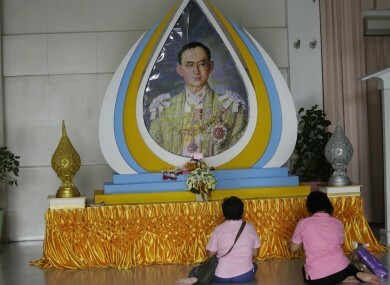 On Sunday, a woman accused of insulting the late kind in online comments was arrested and later forced to kneel and pray before a portrait of King Adulyadej. She has since been charged with lese majeste- an offence against the dignity of a reigning sovereign. Today, the country’s Justice Minister Paiboon Koomchaya said Thais should ‘socially sanction’ those who defame the monarchy. “There is no better way to punish these people than to socially sanction them,” he told reporters today, as he vowed to “pursue those people who violate the law”. Thailand’s monarchy is protected by a draconian lese majeste law that outlaws criticism with punishments of up to 15 years in jail for each insult uttered. Prosecutions have surged under the military, which seized power two years ago, with record-breaking sentences handed down in some cases. That has made detailed discussion or debate about the monarchy’s role- and its future after Bhumibol’s 70-year reign – all but impossible. The atmosphere in Bangkok has been overwhelmingly sombre and calm since the death of the king. But there has been an uptick of angry social media calls by hardline royalists for vigilante action against alleged transgressors of ’112′ – the criminal code that covers the feared law. Similar mobs have formed on the southern island of Phuket and in nearby Phang Nga province, sparked by alleged comments Other social media users have berated those deemed not to be mourning sufficiently deeply or failing to wear black clothes. The latter phenomenon dubbed “black-shaming” has been condemned by the junta Media inside Thailand, both local and foreign, must heavily self-censor. Authorities, however, struggle to censor critics or media based overseas. But Paiboon said the junta would renew extradition requests for Thais abroad — something that is unlikely to sway governments in countries where lese majeste is not a crime. Email “Man beaten by mob for insulting Thai monarchy ”. Feedback on “Man beaten by mob for insulting Thai monarchy ”.